The time between your line edits and clicking that “submit for preorder” button is a daunting one. On the one hand, you’ve read your book so many times you’re sick of it. On the other, you have that fear: What if I miss something? To combat that fear, we’ve added some book proofing tips to help you get peace of mind. We’re digital people, so we don’t print out manuscripts. Ever. (Save the trees!) The lone exception comes at the time of final proofing, when we order the first proof from CreateSpace. This is quite possibly the best and worst part of the process. Best, because it’s finally a real book! Worst, because it’s time to find those last oopsies. A note on proofing and your service provider: If you’re using a hybrid approach with CreateSpace and Ingram, know that you will have to approve the book on Ingram before you can order a printed copy and pay for any edits for new versions. Therefore, we recommend using CreateSpace to proof your book. After an unboxing video, we get right to work with a red pen. That’s right, bibliophiles, we’ll mark up that pretty book like there’s no tomorrow. Because the book has already been through a line editor, there shouldn’t be too many issues. But even the best editor misses things, and you might find small things you forgot to incorporate as well. Do your best to stay out of the story. For this work, it’s better to take breaks than try to eat the whole apple. If you find yourself slipping into the action, step away until you’ve rested enough. One of the benefits of getting a printed proof is you’ll not only get a chance to see the text, but any custom formatting. This is the time where you can adjust spacing or size to move a scene break from one page to another, or fix any issues with your chapter headings. Note: If formatting is making your head spin, contact us for a quote. 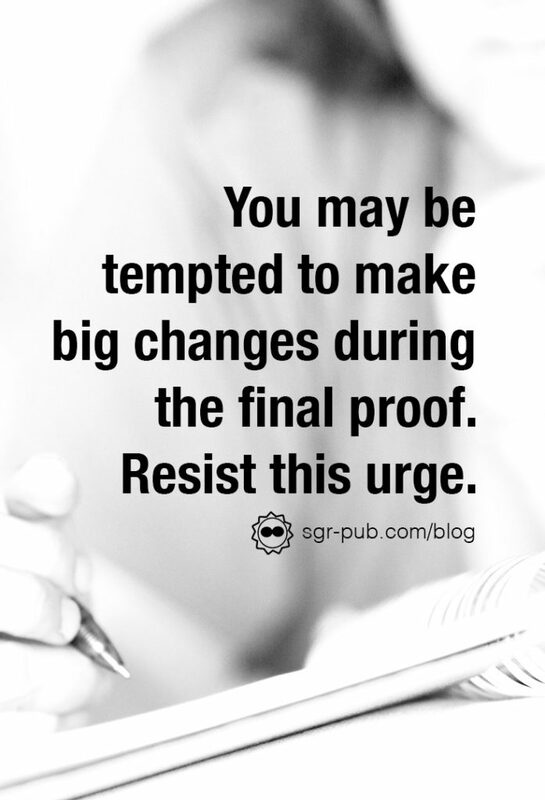 You may be tempted to tweak things in your book at this point. Maybe change a phrase, maybe adjust a plot point. Resist this urge unless it’s absolutely necessary. 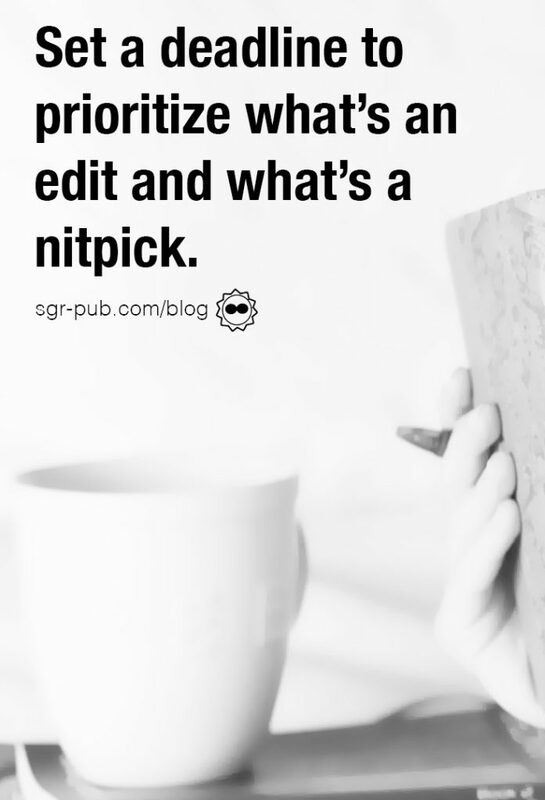 All authors are perfectionists, but if you continue dithering in the details, you’ll never get the book out the door. This is why we recommend setting a deadline to have the book finalized. That way, you’ll have to decide: Is this edit necessary or just nit-picking? Another surefire way to know if you’re nitpicking: If you’ve flagged something in the printed proof, but upon reading it in the manuscript, you find it doesn’t bother you. Because we don’t trust our own eyes, once we’ve proofed the book, we enlist some of our most eagle-eyed readers to take a gander. This is an oft-used double-win for indie authors: You’re releasing early versions to your favorite readers and getting help finding typos. Without fail, our readers always come back with different typos, telling us that truly no one is infallible. If you don’t have readers yet, or you don’t trust them, another great tool is to listen to the book using a text-to-speech function. It comes standard in all Mac computers, and is available through some programs for Windows. While we’ve used this tactic before on blog posts and shorter texts, sitting and listening to a book for a few hours has proven to be difficult. But if you want to make absolutely sure, it’s a great option.